A project for the boat refugees from Africa and Syria, and local people in difficult situations. Clog Austria performed in places for children with a migation background of 100%. In January 2016, Clowns Without Borders Austria visited a refugee home managed by Caritas in Vienna and performed in front of 60 people. 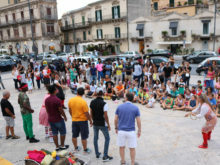 In 2016, Clowns Without Borders Austria performed in the refugee children’s place in Macondo, a village hosting 3000 refugees in Vienna, from many different nationalities. 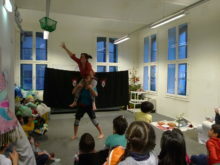 In January 2016, Clowns Without Borders Austria visited a refugee home managed by the Red Cross in Vienna and performed in front of 60 people.